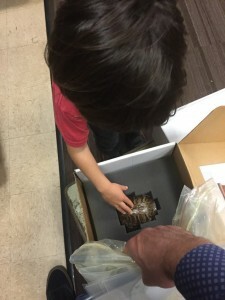 Harris Collection at the Field Museum | seedLinG! 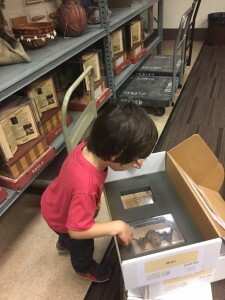 Perhaps you’ve noticed large, white boxes with exciting contents such as world instruments, animals pelts, or crazy shoes in your child’s classroom? Maybe a beautiful stuffed owl or a bat skeleton to study? 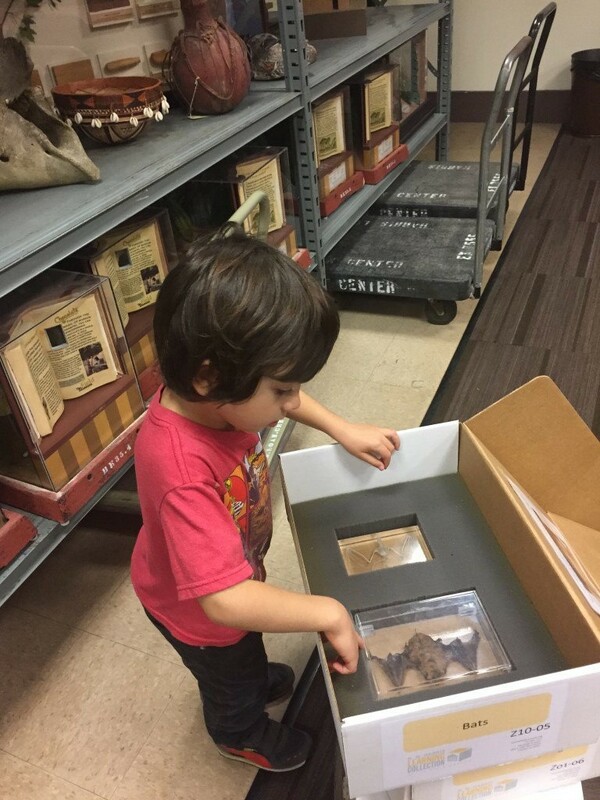 These hands-on learning experiences are due to the wonderful Harris Learning Collection, found in the basement of the Field Museum. 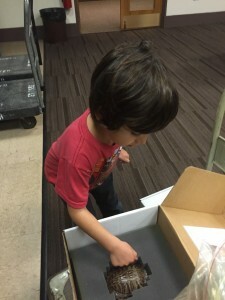 My children and I are thrilled to be part of the Harris Collection pick-up. As frequent goers of all Chicago museums, an excuse to explore parts of the museum that we would not otherwise see is very exciting. Ms. Amy had printed out a map and instructions making the whole pick-up process super easy. Always appreciated with kids in tow! There is a parking lot where you can park for free and it is nice and close to the entrance for pick-up. We went a little earlier so that we could have time to explore the museum first. 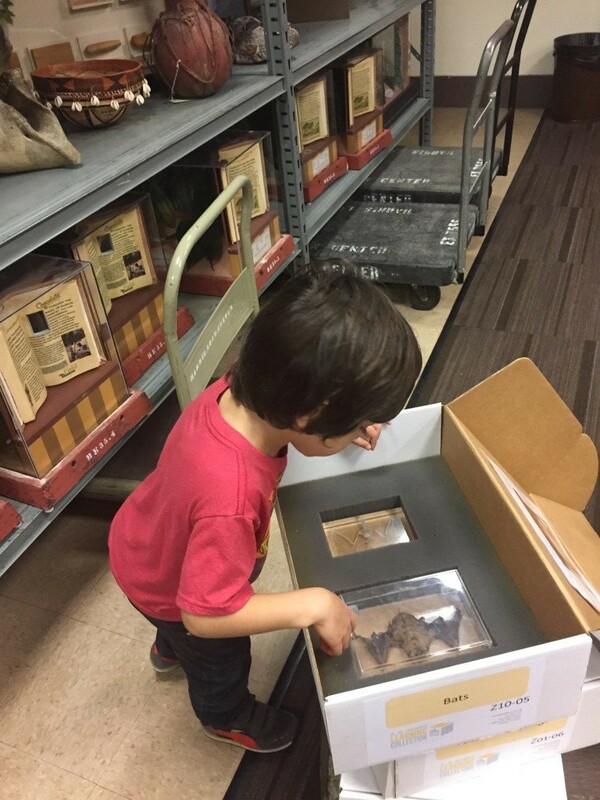 When it was time to pick-up from the Harris Collection, we went downstairs to select our items. The shelves were filled with many old artifacts, retired from the museum, that evoked a sense of wonder and excitement. The teacher working there was so great with my children. She let them look at and touch anything. We were not rushed and she was so patient. She was genuinely happy to have children there and appreciated their interest in everything. When it was time to collect our items for Cortland, she brought out a big cart with a giant crate; the kids were so excited to look inside! She then brought out another box, and let the kids look; she explained what everything was. We carted our treasures to the car. My son, Nikolas, was very excited and proud to bring these treasures to school the next day! I was very impressed with the museum and staff, we had a great experience. It’s a beautiful thing to provide hands-on experience to children. (It really sparks their inborn sense of wonder!) Bravo to the Harris Learning Collection and bravo to Ms. Amy for coordinating every year and bringing such a great experience to our children!